The story is about a diverse group of people find their lives intertwined on New Year's Eve in New York City. Wow just wow, How can a movie like this be made because this movie is just a waste of time to the viewers. The characters are shallow and a old tree has more character then there's people. the directing is horrible and the cast are all wasted. Just a bunch of well known actors crumpled up in a bad movie with a horrible plot. This is a horrible film, devoid of life, plot, charm, and humor. It's a textbook example of having too many characters; there are so many familiar faces packed into this film that it becomes impossible to both follow and care about any of them. The film's attempts at intersecting storylines become too coincidental and, simply put, there are just too many storylines going on for the audience to invest in any of them. The Star-Studded cast alone makes this movie worth seeing and the focus was New York City which I loved! Occasionally, when my cupboards are a little bare and I haven’t had the chance to get to the grocery store, I will rummage through my refrigerator and try to come up with a creative masterpiece to put in front of my family for dinner. 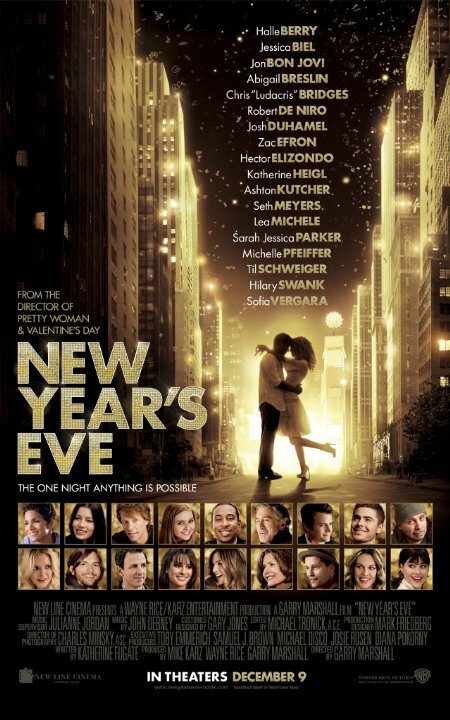 That’s kind of the premise behind the movie “New Year’s Eve”, the latest concoction of director Gary Marshall. I’m not saying it’s unfit for consumption, but the chance of anyone wanting seconds is going to be rather small. No posts have been made on this movie yet. Be the first to start talking about New Year's Eve!